762mm or 381mm Square tiles x 40 or 73mm thick. Grey in colour. Egg Box type acoustic tiles are a popular method of controlling reverberation within studios and music practice rooms. They have a surface that resembles an egg box, hence their name and are an inexpensive method of controlling the acoustics. 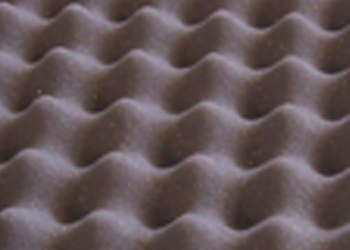 Egg Box type acoustic tiles are a popular method of controlling reverberation within studios and music practice rooms. They have a surface that resembles an egg box, hence their name and are an inexpensive method of controlling the acoustics. The uneven surface of these acoustic tiles enables them to absorb a greater range of frequencies and sound waves and the thicker the tiles the more efficiently they will absorb lower frequencies. This is why we offer egg box type tiles with an overall thickness of 40mm and 73mm for those lower frequencies. Egg Box type profiled acoustic foam tiles can be easily fixed with our special Sta-Put aerosol adhesive and are available in any colour you want as long as it is grey. They are flame resistant but if a completely non-flammable sound absorber is required, have a look at our white Echosorption tiles. All studios and music practice rooms benefit from the installation of acoustic treatment usually on walls and ceilings and our Egg Box Foam Tiles are an efficient way of breaking up any reverberation and echo within the rooms that would otherwise clutter a mix or recording. No efficient studio is without sound absorbing acoustic tiles along with corner base traps and we can offer acoustic corner traps that will help get the best from your studio when used in combination with the Egg Box acoustic tiles. Does the profile of foam make a diffeRENCE to performance? 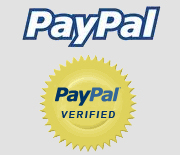 Yes it does and plain faced acoustic foam and profiled foams both have their pros and cons. 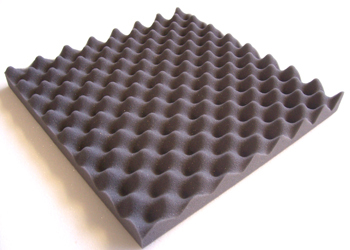 First we will discuss plain foam such as our normal sound absorbing foams. Because these have no profile they can be more effective at absorbing sound due to the fact there is more sound absorbing foam. Where as with profiled foams with their valleys and troughs, there is not the same volume of sound absorbing foam so there is less sound absorption. The more foam there is to absorb the frequencies then usually, the better the performance will be. Normally, plain faced acoustic foam give a better sound absorption at lower frequencies and typically, the thicker the foam, the better low-end sound absorption will be. Low frequencies have longer wavelengths that mean thicker sound absorbing foam is required to effectively soak these up. 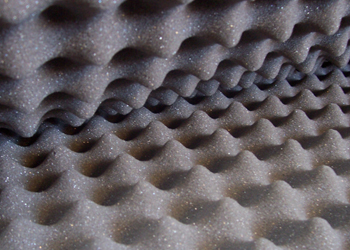 Sound absorbing foams absorb sound in a similar way that a sponge absorbs water. The thicker the sponge, the more water it will soak up. The same can be said for acoustic foam, the thicker the foam, the more efficient it will be at absorbing noise, particularly at the low frequency end but be carefull, too thick a foam can mean less sound absorption for mid to higher frequencies. This brings us to the downsides of plain faced foam. Plain faced foams do not have the same surface area as profiled egg box type foams so sound hitting the foam, particularly at shallow angles can have a tendency to Bounce off the foam with little or no sound absorption. Correct placing of the foam can reduce this problem but the plain surface of this type of foam may not be aesthetically pleasing which is one of the reasons why you will often see profiled foam in a studio or music practice room. Egg box and other profiled foams are the preferred choice not only due to their appearance but because they are more efficient at absorbing a wider range of frequencies due to their uneven surface and if the foam is thick enough, will also absorb those annoying lower frequencies. To get the acoustic balance within a room just right, sound absorption of bass notes is a priority and because bass notes usually build up in corners, our plain faced Corner Traps help deal with this instead of a more expensive bass trap. However, if thicker than 73mm sound absorption is required elsewhere, then plain faced foam can be used to build up the thickness and egg box type foam glued on top using our easy to use Sta-Put aerosol adhesive. As we have said before, profiled sound absorbing foams will trap a greater range of frequencies and will tighten up those mid to high range frequencies that may not necessarily be addressed with thick plain faced foams and will reduce sound reflections within a room. Bass traps will almost certainly be required in addition, to cope with the low end frequencies that are always more difficult to treat and absorb. A combination of profiled foams, plain faced foams and acoustic corner traps will help achieve much better response and control of sound within any room and now means you are able to cut down the reverberation or echo within a room to suit your needs both visually and acoustically.